This is the second in my series of posts looking at some of Andy Diggle’s previous work, in light of his taking over Daredevil in September. Regular readers will remember my review of The Losers from a couple of weeks ago. The Lady Constantine four-issue Hellblazer miniseries is quite a departure from The Losers as we travel back in time to 1785 and start dealing with magic and demonic creatures. 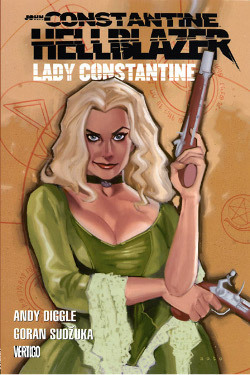 Diggle also had a longer run on the main John Constantine: Hellblazer book (which I’ll have reasons to return to), but this particular mini is completely independent of the main book and features John Constantine’s distant ancestor Johanna. I came to this book with very few preconceived ideas of what it was about and can’t tell you anything about whether or not it fits the tone of what one would expect from a Hellblazer series. Having said that, I quite like this little tale. It’s not exactly timeless classic material, but it’s a well-crafted story that reads like a dark fairytale for grown-ups. Johanna Constantine is a determined woman with knowledge of the dark arts who will do whatever it takes to claim back that which she feels is rightfully hers, the privileges her family once lost. To do this, she takes on an unusual mission to retrieve a chest from the bottom of the ocean, no questions asked, and without quite knowing whether she’s up to the task. With her little sister Mouse in tow, she sets out on a very dangerous journey that makes you both admire her courage and tenacity while questioning her reasons for throwing caution so completely to the wind and risk the life of her loved ones for money and power. She’s not the only one in pursuit of the chest, however, as its original keeper, the thousands of years old Lady Blackwell needs for it to be opened to lift her own curse of immortality even as it threatens the fate of the entire world. As the story moves along, Johanna finds out she may have bitten off more than she can chew and her victory is destined to be pyrrhic, at best. What is evident from this story, just as it was in The Losers, is Diggle’s nack for excellent pacing, quick-witted dialogue and the kind of clever plot twists that you can’t help being impressed with. He knows his craft and leaves nothing to chance and no plot threads dangling. Goran Sudzuka’s art is a perfect fit for this modern fairytale and features easily distinguishable characters, expressions and events. In closing, I enjoyed this story a lot. While not as much of a “must read” as The Losers, I’d recommend this story for those of you who enjoy a touch of magic, adventure and far away places. First of all, let’s take a moment to appreciate the fact that this is issue #25 of Mark Waid’s run on Daredevil. Even artist Chris Samnee, who came onboard later, now has twelve issues of Daredevil to his credit. Javíer Rodriguez, meanwhile, has been around since the very start, coloring almost every single issue of volume 3 thus far. Also, wow. Phil Noto is amazing.